In 203 AD, the massive Arch of Septimius Severus was constructed to honor Emperor Septimius Severus, as well as his sons, Caracalla and Geta. It is located in Rome, Italy, and is close to the Capitoline Hill. The triple arch is covered in Pentelic marble, and is located at the northwest corner of the Roman Forum. There are four very large reliefs that commemorate Severus’ victories over the Parthians. Two of the reliefs face the Capitoline, and the other two face the Forum side. The ancient arch is nearly 68 feet high and about 76 feet wide. It contains three curved passages which have columns on pedestals. It originally had a stairway that passed through the main archway. The arch was elevated on a large travertine base that was approached by a stairway from the ancient level of the Forum. The central arch is spanned by a coffered semicircular vault that has horizontal openings to each side of the arch. This feature is replicated in several Early Modern arches. Winged Victory reliefs are carved into each of the spandrels. There is the Arch of Trajan staircase at the south pier that goes to the monument’s top. After Septimius Severus died, his sons Geta and Caracalla ruled together as emperors. In 212, Caracalla had Geta killed, and then had Geta’s name, along with all of his images removed from the Arch of Septimius Severus, as well as many other monuments and public buildings. By the fourth century the Forum’s level had risen because of erosion. A large amount of silt and debris had eroded away from nearby hills. 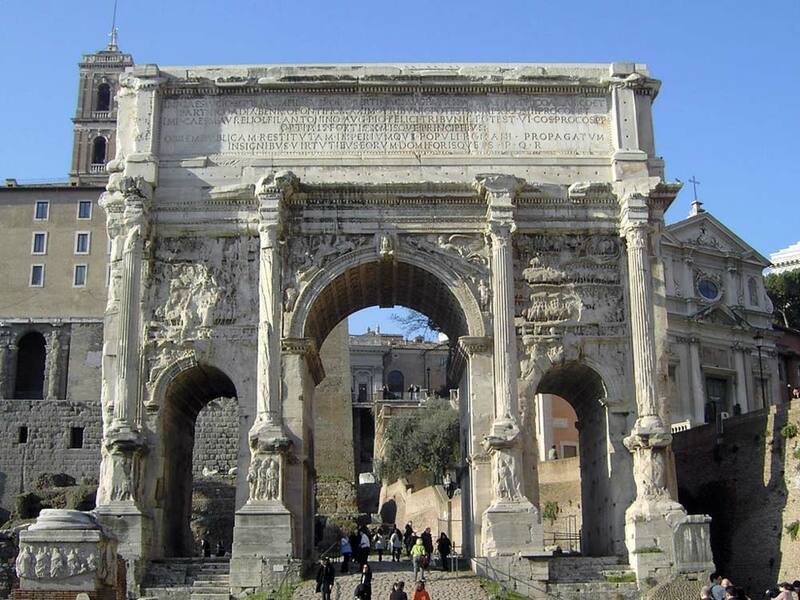 A roadway was then built and put through the Arch of Septimius Severus. The relief panels depict a variety of stages of war between the Parthians and Romans. Other panels display Romans capturing barbarians. The arch originally had a bronze chariot and inscriptions at the top. The arch is a very well preserved monument on the Roman Forum because of its incorporation as part of the church during the Middle Ages. After the church relocated to another area, it still owned The Arch of Septimius Severus, and protected it from harm. Today, this famous arch is still a very well preserved monument at the ancient Forum. Damage caused by medieval wheeled vehicles is still seen on some of the column bases. There is no charge to see this triumphal arch, and it is always open to the public.